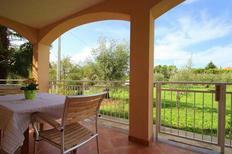 Holiday villa with space for up to ten people located near Kavran. “Very tidy and well-maintained holiday apartment in a beautiful, peaceful location with a wonderful view,” wrote one customer about the holiday accommodation in Istria. Istria | Would you like to know which holiday home or apartment is particularly worth spending a holiday in? 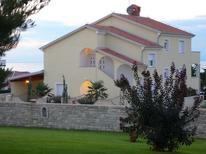 Here we'll show you the accommodation in Istria, which has received the best reviews from our customers. ​Rovinj | Winding historic streets, picturesque beaches, great gastronomy – you have selected a true pearl of the Adriatic as the best holiday resort in Croatia. Read more in our blog! Pedestrian precinct in front of a holiday home for up to five people in the historic quarter of Rovinj. ​Istria | Medulin, Rovinj, Umag, Poreč, Novigrad – Istria’s towns offer a lot of potential for discoveries with their old cobbled streets and idyllic harbours. We have the right apartment for this. Rovinj | The picturesque townscape with the beaches and its historic quarter on a peninsula have won over the holidaymakers, and made Rovinj, on Istria’s west coast, the best holiday resort. 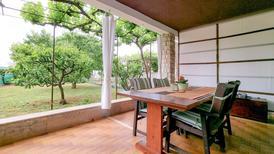 A holiday house in Istria costs on average GBP 602 in the cheap travel period and GBP 1,089 in the peak season per week. These details are of course in relation to the house and not per person as well as includes the obligatory additional charges. 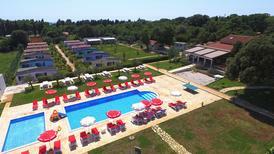 atraveo offers a wide selection of more than 14,200 holiday apartments and houses in Istria. The The Croatian peninsula is regarded as one of the most loveliest regions of the Adriatic and captivates vacationers with both its many great beaches and picturesque landscape as well as appealing towns. The offer range provided by atraveo ensures you should find the ideal holiday home meeting your requirements: From a small apartment in a coastal resort to a large holiday house for a group of people there is a vast choice available. Also holiday homes with a number of extra amenities are offered for example some have an especially large enclosed property or an own swimming pool. And all is provided at a relatively good price ratio. Sun, beach and sea are predominantly in the focus when thinking about a vacation in Istria. There are an abundance of lovely beaches to be found along the more than 500 kilometre long coastline. Long stretched out sandy beaches, idyllic shingle beaches in small bay or secluded rocky beaches – the great choice and deep blue Mediterranean Sea virtually offer perfect conditions for a splendid beach vacation. The main thing is you take enough sun creme with you. Divers, snorkelers and other water sport enthusiasts will also find more than enough to do at the Istria‘s coasts and they can also look forward to above average water quality. Very nice beach strips with a particularly large choice of holiday homes can be found in all major places such as Medulin, Porec, Pula, Umag and Rabac. The many lovely towns and villages have retained their charm in Istria making them particularly appealing. The largest town Pula on the southern side of the peninsula has a number of sights such as the very well preserved amphitheatre built under Emperor Augustus and is regarded as a landmark of the town. Poreč on the western coast has a number of temple remains which also point to the region’s Roman past and Rovinj impresses with its picturesque townscape and the church that that towers above the town on a hill. 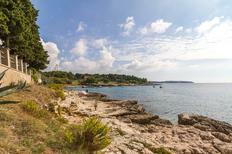 Other nice coastal resorts in Istria include Rabac, Medulin, Vrsar and Umag. Also worth the odd day trip is Rijeka at Kvarner Gulf or Trieste in nearby Italy. In the heartland where Istria is clearly less populated you will find many pretty small villages. Some lie especially strikingly on hillsides and tower above the landscape. Often one will find the odd interesting sight as for example a pretty church. Bigger towns in the hinterland include Opatija, Motovun and Grožnjan known for the artist living here. A further tourist highlight is Hum which is close to Buzet and with 20 inhabitants regarded as the smallest town of the world. The nice landscape in the inland of the peninsula can also be very well discovered on a hike or during the course of an extensive bicycle or mountain bike tour. Along vineyards and through shaded truffle forests you can properly enjoy the nature Lim Bay is a special attraction which is likened to a fjord that reaches back into the hinterland where sometimes even dolphins have been sighted. Worth a day trip is the Brijuni National Park situated in the southern part of Istria. The reserve close to Pula and spread across 14 islands does not only impress with its lovely landscape and diverse flore and fauna but here you can discover fossilized footprints of dinosaurs. The safari park on Veli Brijun should prove to be particularly popular with the little ones as they can observe elephants, zebras and other animals. Furthermore here you will also find the Tito Museum that is a reminder of the former Yugoslav leader who once had a residence here. There is a regular connection to the Brijuni Islands from Fažana. With more than 2,000 sun hours a year you are virtually ensured to have good weather when spending a holiday home vacation in Istria. As the region is typically Mediterranean it can get quite hot during the summer. 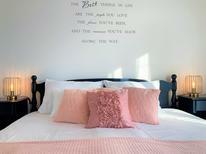 Here only a cool breeze from the sea or pool at the holiday home can provide for some respite. Even though the summer time is a very popular travel period the region is especially nice outside the main season in both May and June as well as in September and early October. ... to get to your holiday home in Istria is by plane. International airports with regular flights are available in Pula and Rijeka.